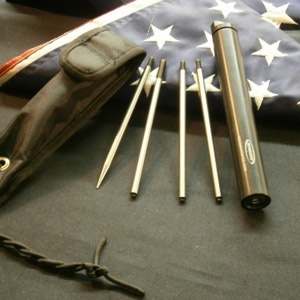 Mission Knives manufactures the TA probes (Take apart probes) that are non-magnetic humanitarian demining EOD probes, made from our special blend titanium. The TA EOD probes have been extremely successful, especially demining influence mines. The TA-3 & 4 store within the Delrin handle secured with a screw down top. The probes screw into the titanium flange molded to the handle body when in use. Mission's TA-3 includes 5pcs (tip, 3 extensions, Delrin handle), non-knurled. The TA-4 includes 5pcs (tip, 3 extensions, Delrin handle), knurled for extra grip which makes for easier disassembly in the rain, snow, mud, with gloves on or while under water. All TA probes are .250" diameter and include a Nylon probe sheath pouch that can be worn on the belt or carried in a load bearing vest pocket. The current "suicide sticks" (made out of plastic, carbon fiber or fiberglass fishing rods, aluminum, wood, etc.) bend, break and give the operator an unclear feel when locating mines. Mission has designed these titanium probes to keep the operator alive.